The stylishly decorated rooms of the Wyndham Köln Hotel provide an ideal retreat after a long day in Cologne. End the day with a good film or an interesting football game and keep in touch with friends, family and colleagues via the free WiFi internet connection. 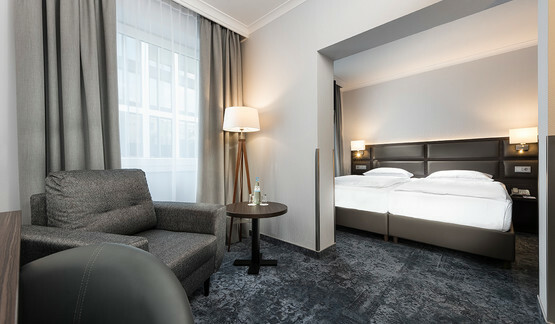 All the rooms at the Wyndham Köln Hotel were renovated in 2018 and are fitted with air conditioning and soundproof windows. 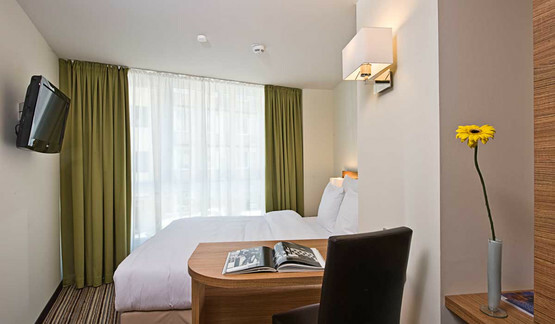 Standard hotel rooms are ideal for business travellers and visitors planning a short trip to Cologne. Our hotel's comfortable beds ensure a good night's sleep and tempt every guest to have a lie-in. The free WiFi internet connection in the rooms keeps you in touch with your colleagues, friends and family at any time of the day or night. A free bottle of mineral water is on hand as refreshment. A kettle and a selection of teas and coffees provide you a relaxed start to the morning at the Wyndham Köln Hotel. The air-conditioned superior hotel rooms of the Wyndham Köln Hotel, equipped with TV, safe, air conditioning, coffee or tea facilities, Wi-Fi, mineral water, offer plenty of space. The spacious superior room is decorated in a classic modern style. Make yourself comfortable with a cup of tea or coffee and spend a relaxing evening with a hot bath or a good movie. With free wireless internet access in the rooms, you can always stay in touch with your colleagues, friends and family. Whether you are on a business trip or vacationing with the family, in the superior room at Wyndham Cologne you will definitely enjoy your stay. All children under 3 years stay free of charge for children's cots/cribs. All children from 12 to 18 years are charged EUR 45 per person per night for extra beds. All adults are charged EUR 45 per person per night for extra beds. 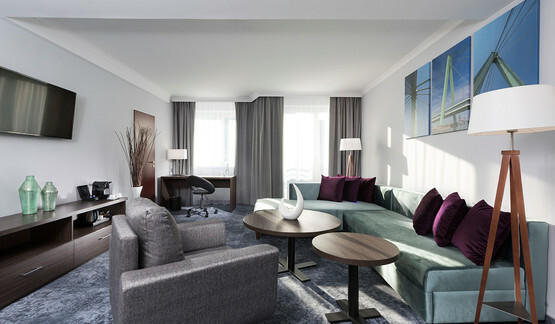 The suite in Wnyham Cologne, which was completely renovated in 2018, offers a unique view of the Cologne Cathedral. With air conditioning and Wi-Fi in the spacious living room and in the adjacent sleeping area, a walk-in closet with ironing station and safe, a large bathroom with tub and bidet, the room is well equipped. The hotel Suites at Wyndham Koeln Hotel are decorated individually and lovingly and are fitted with high quality furniture and materials to ensure peace and relaxation. The Suites also provide a fully equipped kitchen with fridge and microwave and a Nespresso-machine. On top of that, you can use the Business Lounge, including a large workspace, a computer with an internet connection and a printer, free of charge. Unlimited coffee from the coffee pad machine and soft drinks are provided. Whether business travelers or families enjoy the stay in the Deluxe room of Wyndham Cologne. With the generous equipment of the room, including TV, safe, air conditioning, coffee or tea making facilities, coffee machine, ironing station and free mineral water, you will not miss anything. 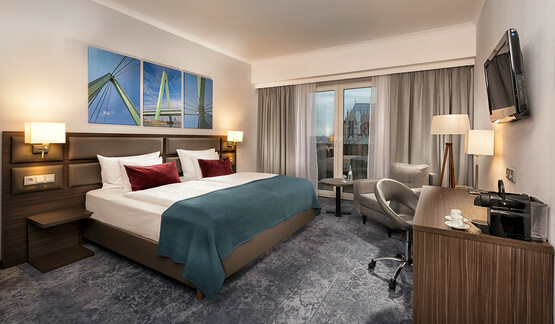 The spacious, air-conditioned deluxe rooms at Wyndham Cologne are decorated in a classic modern style and offer plenty of space and amazing view of Cologne Cathedral. Make yourself comfortable with a cup of tea or coffee and spend a relaxing evening with a hot bath, a good movie or simply enjoy the magnificent view. Stay in touch with your colleagues, friends or family with free WiFi in your room.